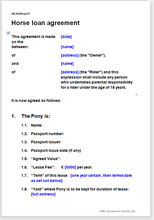 Agreement to protect an owner and their horse or pony loaned or rented for even ting, jumping or showing. This Document is a flexible agreement which will suit most circumstances. Simply amend it at the places marked to suit your requirements. You can use it again and again. It covers both the loan of a horse for even ting or jumping and a pony for showing. It includes alternative provision for circumstances when the owner contributes or alternatively where the borrower pays for the use of the horse or pony. It is always important to record agreements in writing. This is a comprehensive document, designed to suit both parties. It will help you make a proper record of the transaction and help protect you from the “compensation culture”.